For some of us, the three most beautiful words in the English language are Lemon Daisy Cupcakes. As adorability goes, these are up there with puppies. Prepare cake batter and bake as directed on pkg. for 24 cupcakes. Cool in pans 10 min. Meanwhile, dip 12 wafers in chocolate; set aside. Beat pudding mixes and milk in large bowl with whisk 2 min. Stir in 2 cups COOL WHIP; spoon 1-1/2 cups into resealable plastic bag. Seal bag; cut off small corner from bottom of bag. Pipe about 1 Tbsp. pudding mixture into center of each cupcake. Frost with remaining pudding mixture. 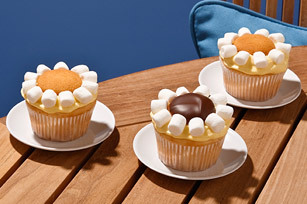 Decorate cupcakes with wafers, marshmallows and any remaining melted chocolate to resemble daisies. Keep refrigerated. Use pastry bag fitted with large tip to pipe pudding mixture into cupcakes. If you have difficulty piping the pudding mixture into the cupcake, use the handle of a wooden spoon to poke a hole in top of each cupcake before filling with pudding mixture.